Limited edition 180 gram double vinyl. Digitally restored audio remastered for vinylincludes 4 page insert with exclusive lyric sheet. 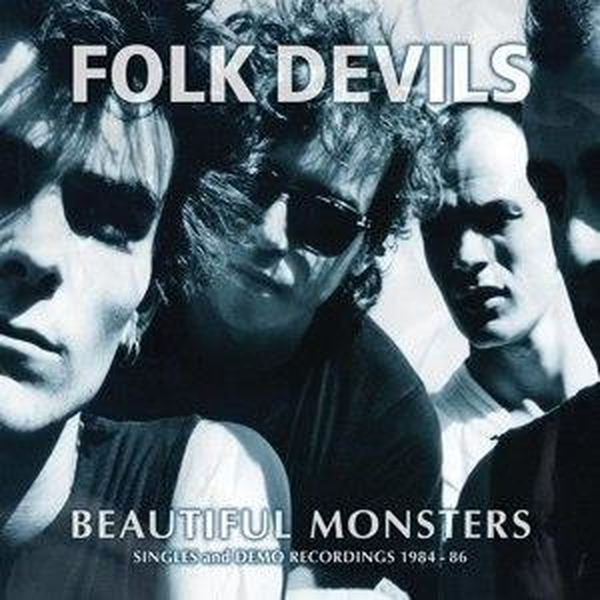 "BEAUTIFUL MONSTERS (SINGLES and DEMO RECORDINGS 1984-86)" offers the complete Folk Devils singles collection plus bonus unreleased demo recordings. Named after Stanley Cohen's book on youth subcultures "Folk Devils and Moral Panics", this highly underrated British band was as far as one could get from 'Folk music' at the time. Throughout their short lifespan, the band released several acclaimed independent singles including "Hank Turns Blue", "Beautiful Monster", 1985's intense "Fire And Chrome" EP, and recorded three sessions for BBC Radio's John Peel Show. By early 1984, their heady brew of swampy rock on a bed of bastardized blues had created a vehicle for Lowery's increasingly misanthropic worldview. A well-honed gutter poet since the early days of punk, Ian developed an idiosyncratic style, fusing a natural gift for sly wordplay and a well-turned snarky phrase with his often vitriolic and poignant lyrics channeled through an explosive onstage persona. By 1985, their sound was becoming sharp, ominous, brooding and urgent, and had taken shape with the help of producer Richard Mazda, with whom they collaborated several times. These newly digitally re-mastered recordings have been painstakingly restored from the original master tapes, which had spent 30 years languishing in Nick Jones' archives Never before released on CD, the re-mastered sound captures the ragged fury and adrenalized energy that uniquely characterized the Folk Devils oeuvre. Also included here are eight demo recordings that feature some of their best unreleased material, both musically and lyrically. Jimi Hendrix - Mannish Boy / Trash Men (RSD18) 7"